Coraline has low muscle tone (hypotonia) which is a characteristic of Down’s Syndrome. We are really lucky that she has a Physiotherapist who comes to our house about once a month to help her strengthen her muscle function. Last week’s visit was really interesting and I learned a lot about what her Physiotherapist is building up. 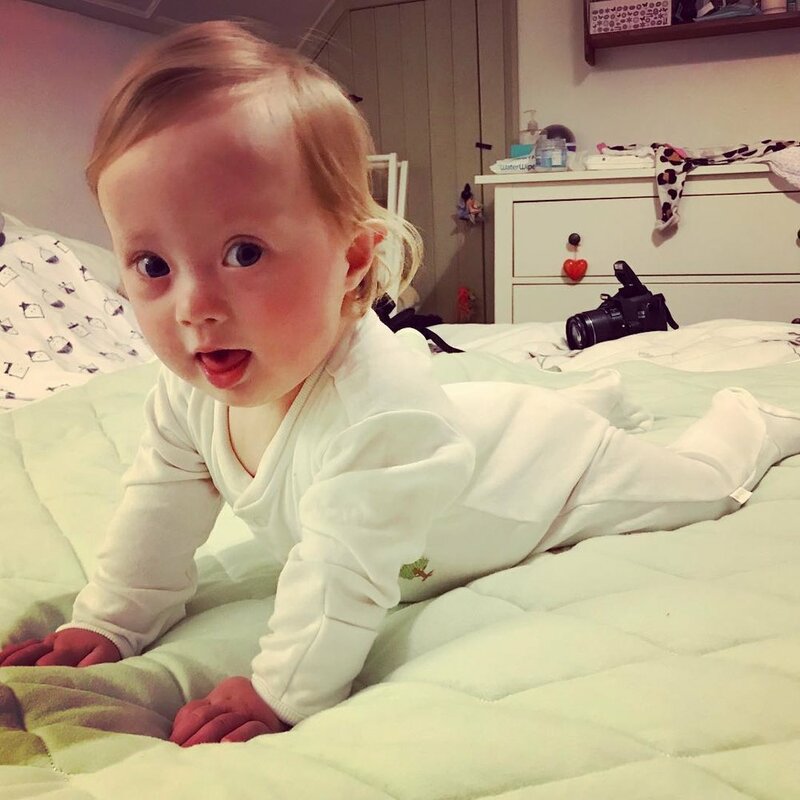 I remember her saying a few times back that the most important thing is for Coraline simply to have time on the mat and that, in doing that, Coraline will do her own physio. Coraline has got her arms extended here which was a change from a month ago when she was propped up on her elbows. So she has stronger shoulders now. Coraline can now get herself up from lying on her front to sitting, and also from sitting back to lying on her front. Her Physiotherapist said it’s all Coraline initiating the movement, whereas before she was helping her at her hips. We practised encouraging movement with Coraline’s mirror which she loves placed a little way away, so she had to move to get to it, and she had to figure out how to do so. This strengthens her muscles, improves coordination, builds muscle memory and movement memory. I learned it’s all about repetition; the more she does it the more automatic it becomes and neural pathways are built. The object she’s getting to has to be a toy she really loves to be sufficiently motivational. It was funny; she really moved for the mirror. As her Physiotherapist said, the best thing for her is simply time on a mat with her toys as she is then practising without knowing it.